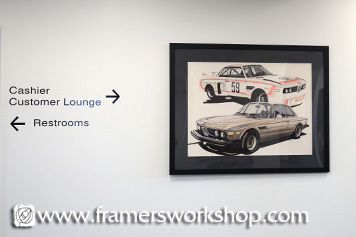 When Weatherford BMW opened a new building in Berkeley to incorporate their sales showroom and service center, they called upon us to integrate their collection of historic original BMW art throughout the building. 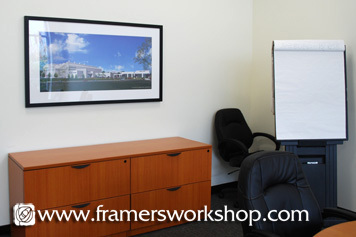 Working with the General Manager and CFO, we designed the framing of original German sketches, photographs, watercolors, and three 99” x 52” paintings for this impressive new building. 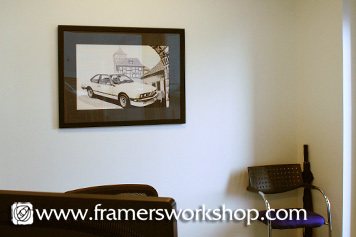 We choose four large Bavarian sketches of BMW automobiles for the service consultant’s and service manager’s glass offices. 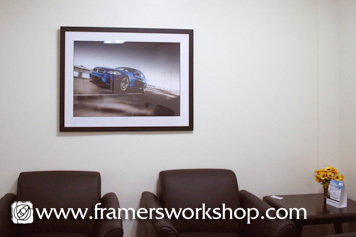 We framed and installed these so that there is one piece of art behind each desk to greet service patrons with an impression of the history that stands behind these automobiles. 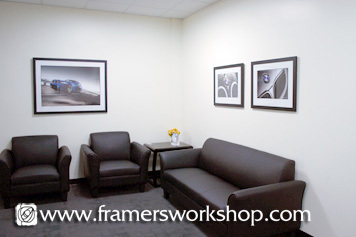 For the Internet Room, an area where guests can work and relax with computers while waiting for their cars to be serviced, we choose one large modern architect’s rendering of the new building as seen from Ashby Avenue. 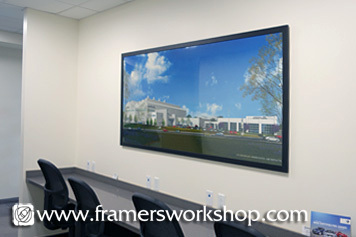 The one large photo visually ties each of the Internet stations together. 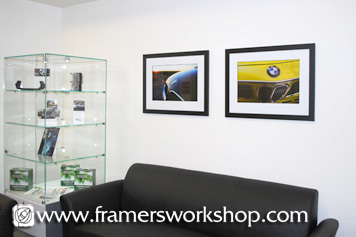 For the customer waiting rooms, we printed close ups of BMW badges from different era cars. 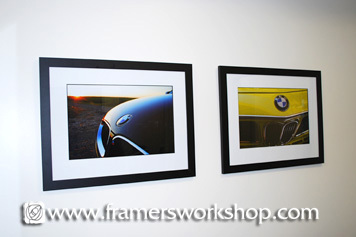 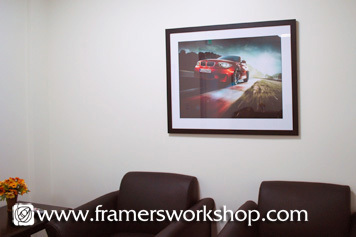 These provide a splash of color to the room and strengthen the immediate presentation of the BMW brand. 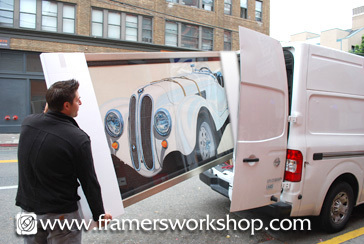 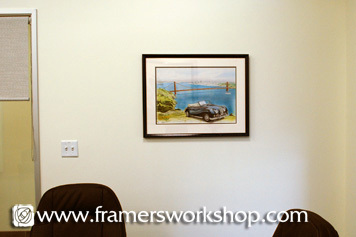 After cleaning the three 99”x 52” original paintings that depict close ups of vintage era automobiles, we gave each a linen liner and sturdy black frame. 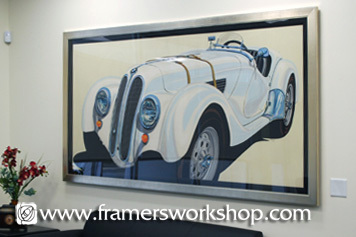 One hangs in the General Manager’s office, and the other two make an impressive display high above the showroom floor. 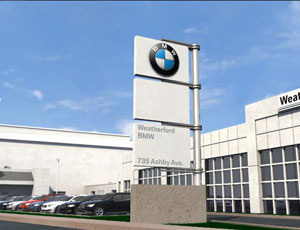 From Weatherford BMW: Weatherford BMW is conveniently located in Berkeley, CA, just off I-80 and Ashby Ave. We offer a brand new, state of the art facility with over 500 New & Certified Pre-Owned BMWs and an indoor showroom holding over 200 cars! 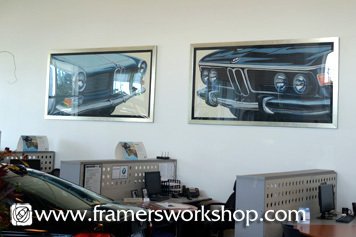 At Weatherford BMW we pride ourselves on commitment to customer service and satisfaction. 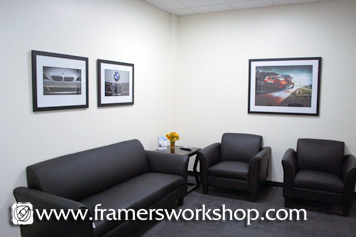 This commitment does not stop with your vehicle purchase; here at Weatherford BMW your purchase is just the beginning. 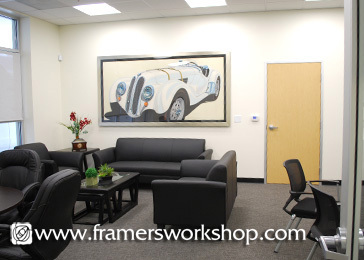 Our Service Department is staffed with factory-trained technicians, ready to perform everything from regular maintenance to expert repairs. 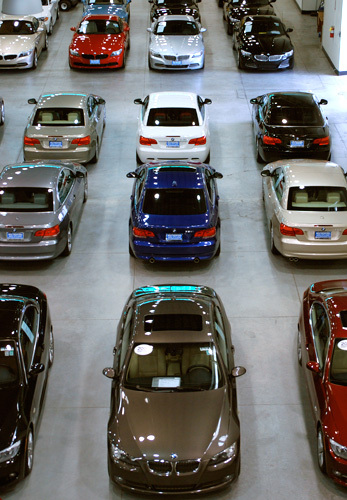 Effective and efficient service with excellence is our goal with every vehicle, every time.